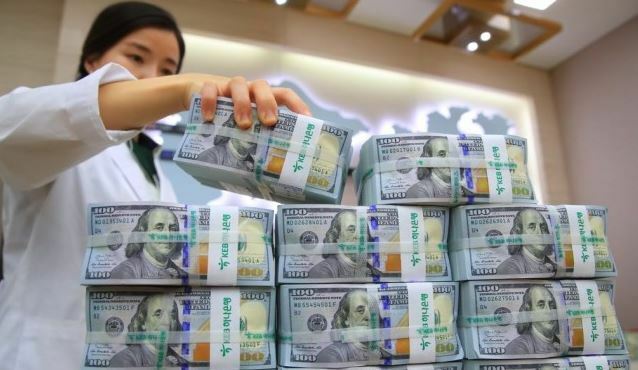 South Korea’s foreign exchange reserves reached a record high level in December, amid a weakening US dollar trend, the central bank said Friday. The total amount of foreign currency holdings stood at $403.69 billion as of the end of December, up $710 million from the previous month, according to the Bank of Korea. This renewed an earlier record of $403 billion observed in September. The appreciation of nondollar currencies when converted into the greenback was largely attributable to the latest depreciation of the US dollar, the BOK explained. In December, the US dollar index fell 0.4 percent on-month against the currencies of six other major economies. Asia’s fourth-largest economy has seen a steady uptrend in its foreign reserves since 2008. As of end-November, the country ranked the world’s eighth-largest holder of foreign reserves, according to the International Monetary Fund.